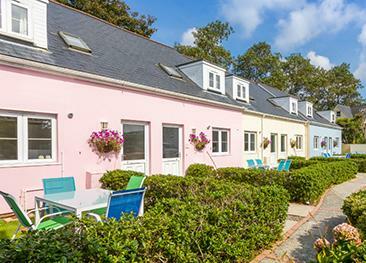 Cliff Top Cottages are situated in the heart of Torteval, just 5 minutes walk away from the beautiful cliff walks and scenery. They are an ideal haven for ornithologists and walkers or for those who want to enjoy the quietness and charm of the island. The safe, sandy beaches of Portelet and Rocquaine are within a couple of minutes by car. The nearest supermarket (open 7 days a week) is in the neighbouring parish of St. Peter. There is also an excellent bus service which passes the cottages on a regular basis which will take you to St. Peter Port or along the north of the island. Le Petit Manoir is graded 4 Star Gold and has a kitchen diner with a fridge/freezer, washing machine, electric oven and microwave, radio and cd player. Leading from the kitchen you step into the hallway, which has a bathroom with a bath and overhead shower, and shaver point. The beamed lounge is equipped with a television with DVD and free view player. A door opens up from the lounge into its own private patio area with hardwood garden furniture. The upstairs bedroom has twin beds and pine furniture. La Petite Grange is graded 4 Star Gold and has a kitchen diner furnished with electric oven and microwave, fridge, freezer and dishwasher. Glass doors open out from the kitchen/diner into the lounge, which has a sofa bed, and armchair, television with free sat. Doors open out from the lounge onto a private gravelled seating area, which then leads up into the garden. The upstairs bedroom has views across the fields towards the cliffs and is furnished in pine with beams and a 5ft bed and a single bed. Le Faucon is graded 5 Star and has a downstairs cloakroom and a large open plan kitchen/diner/lounge. The kitchen is fully equipped and includes a fridge-freezer, electric oven and hob, dishwasher and microwave and a radio/cd player. The lounge has two comfortable 3 & 2 seater settees and armchair, television with free view and DVD player. There are French patio doors opening out from the lounge onto a private patio area with hardwood garden furniture. There are 2 bedrooms upstairs, a large double bedroom with a king size bed and a fully tiled ensuite shower room with hairdryer and a large treble bedroom with three single beds, television and a fully tiled ensuite bathroom with bath and overhead shower and hairdryer. The annexe room adjoins Le Faucon and consists of a twin bedroom with television and free view player, and an ensuite shower room. La Grange is graded 4 Star Gold and has a downstairs bedroom furnished with antique pine furniture. Next to the bedroom is a fully tiled bathroom with bath and overhead shower, sink, toilet and heated towel rail and a shaver point. Also on the ground floor is a kitchen/diner which is fully equipped with a fridge, freezer, dishwasher, electric oven and micro wave and opens out into the vine house, perfect for sitting into get the last of the evening heat. Upstairs there is another twin bedroom and an upstairs lounge with television and DVD player and is comfortably furnished. 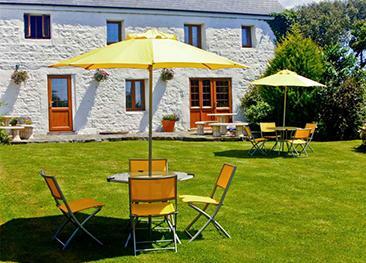 La Chouette is graded 5 Star and has a downstairs cloakroom and a large open plan kitchen/diner/lounge. The kitchen is fully equipped and includes a fridge-freezer, electric oven and hob, dishwasher and microwave and a radio/cd player. The lounge has a granite fireplace with a log burner, a television with free view and DVD player and a payphone. Upstairs there is a large double bedroom with a king size bed and a fully tiled ensuite shower room with hairdryer and a large treble bedroom with three single beds, television and a fully tiled an ensuite bathroom with bath and overhead shower and hairdryer. Cliff Top Cottages are situated in the heart of Torteval, just 5 minutes walk away from the beautiful cliff walks and scenery. They are an ideal haven for ornithologists and walkers or for those who want to enjoy the quietness and charm of the island. Cliff Top Cottages are not suitable for disabled access. 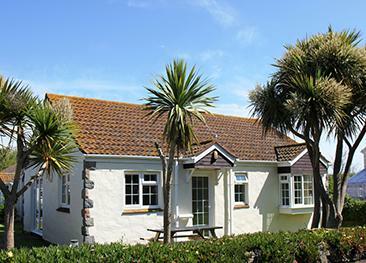 Briquet Self Catering features a collection of attractively furnished cottages, set in substantial landscaped gardens and grounds in the west of Guernsey. Privately owned and maintained, the apartments at La Pointe Farm offer a fantastic location to indulge in Guernsey’s beautiful countryside. Some spectacular sea views can also be enjoyed from around the property.